On Aug. 18, 2012 a rescue boatcrew from Coast Guard Station Sackets Harbor, N.Y., rescued two men from a boat that was taking on water in Lake Ontario. All across the nation, Coast Guard rescue crews engage in similar responses every day, but what made this rescue unique was the crew aboard the rescue boat. 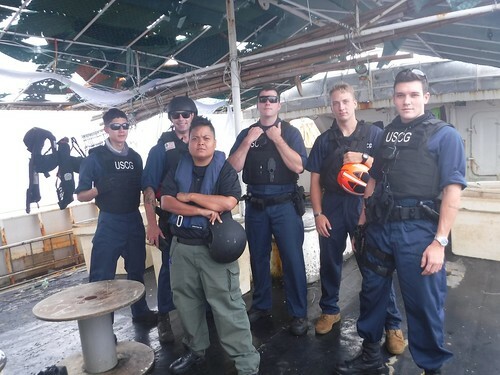 Two members of this rescue crew were Coast Guard reservists assigned to the unit for the entire summer under the 9th Coast Guard District’s Summerstock program. Coast Guard Station Sackets Harbor, N.Y., crewmembers Petty Officer 2nd Class Jimmy Stefanidis and Petty Officer 2nd Class Garrett Hodgson use hand pumps to dewater a boat taking on water in Lake Ontario, Aug. 18, 2012. Stefanidis is a Reservist participating in the 9th Coast Guard District’s Summerstock Program. U.S. Coast Guard photo by Chief Petty Officer Joshua Martin and illustration by Petty Officer 2nd Class Levi Read. 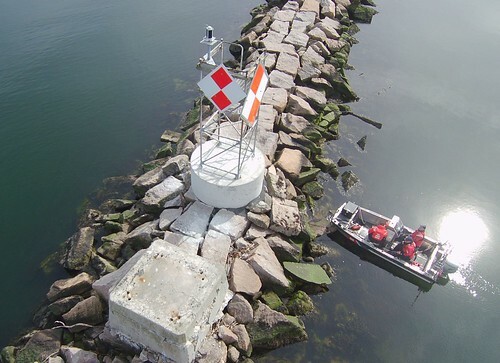 The two active-duty Coast Guardsmen who staff the Sackets Harbor station year-round in conjunction with the Coast Guard Auxiliary cannot do their job without Reserve support. The Coast Guard Auxiliary is a volunteer organization and, as such, auxiliarists work when their schedules allow, not necessarily whenever an emergency occurs.Had this search-and-rescue case happened on any day between the months of September and May, Petty Officer 3rd Class Jimmy Stefanidis would have been tied-up in his full-time job as an electrician on Long Island, N.Y., and Petty Officer 2nd Class Bennett Lesberg would have been busy as a full-time student at Maricosta Community College in San Diego. 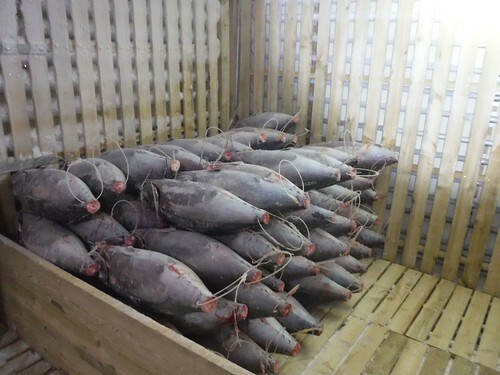 So, it is possible that the Aug. 18 rescue conducted by this boatcrew may have encountered delays because of the seasonal nature of the station and the smaller crew size outside the months of June – August. 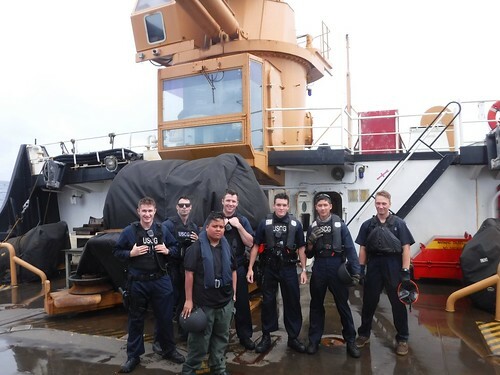 Seasonality is an operational reality in the 9th Coast Guard District. The Great Lakes often freeze from late December through early March, which keeps most recreational boats in storage and keeps boaters indoors. Because of this lost time, the Great Lakes recreational boating community takes to the water at full force during the shortened boating season, traditionally identified as Memorial Day through Labor Day. The summer months draw millions of boaters from major metropolitan areas or remote resorts to the pristine waters of the Great Lakes. To meet the surging demand, Coast Guard Reserve personnel have answered the call to support Summerstock, a program designed to be a seasonal bridge to fill operational gaps while achieving mission excellence. More than 30 million people call the Great Lakes region home – roughly 10 percent of the U.S. population. This includes Chicago, the nation’s third largest city, and 30 percent of the Canadian population, including Toronto, Canada’s largest city. In all, eight U.S. states and three Canadian provinces share the vast freshwater system. Because so many people live in this region and recreate on the water, emergencies and accidents are bound to happen despite the best efforts of the 6,000 active-duty, Reserve, civilian and Auxiliary personnel who staff the 75 units in the 9th Coast Guard District. Petty Officer 3rd Class Bradley Jones, a reservist from Sector Charleston, S.C., and a participant in the 9th Coast Guard District’s Summerstock program, takes down information from a boater’s registration card during a routine vessel boarding on Lake St. Clair, Mich., Sept. 2, 2012. U.S. Coast Guard photo by Station St. Clair Shores. The 9th Coast Guard District is responsible for Coast Guard operations in all five Great Lakes and the waterways that feed the lakes. Although the units remain busy year-round executing the Coast Guard’s 11 statutory missions, summertime is unquestionably the busiest time of year. Ninth District units responded to 1,837 search-and-rescue cases during the months of June, July and August 2012. This accounts for almost three quarters of the district’s yearly total of SAR cases. 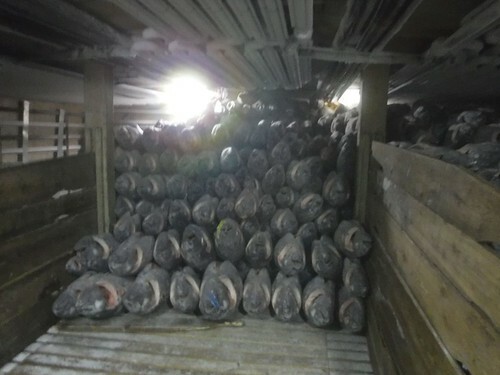 The units also conducted 14,252 vessel boardings in fiscal year 2012, more boardings than any other district. Of those, 9,025 were conducted during the months of June, July and August. The district also logged nearly 26,000 boat hours during the summer months, which is about half their yearly total. 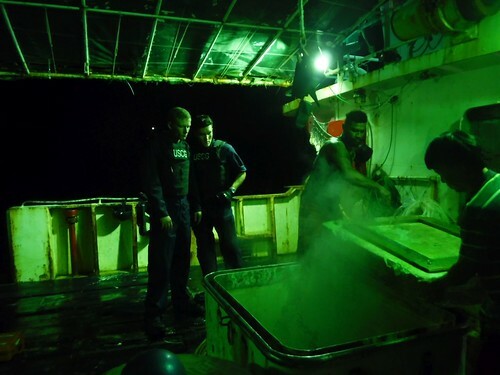 “The units within the 9th Coast Guard District could not have provided this level of coverage without the assistance of qualified reservists from Summerstock,” said Cmdr. David Beck, chief of enforcement for the 9thCoast Guard District. Summerstock has served many purposes since the program began in 1972. Summerstock personnel were first used to staff large standalone units, such as Harbor Safety/Security Team Chicago, which traveled around the district supporting major marine and security events. As operational requirements changed, Summerstock became increasingly critical to bolstering under-staffed multi-mission stations. Of the 39 full-time multi-mission stations around the Great Lakes, ten are below the Coast Guard Boat Forces minimum staffing standard. Although reservists are used from throughout the country, tapping local Great Lakes reservists saves the Coast Guard big money. Summerstock is funded by Coast Guard Headquarters, but the 9th District supplements the program by covering any overages that occur. The cost includes base pay, basic housing allowance, per diem and travel. 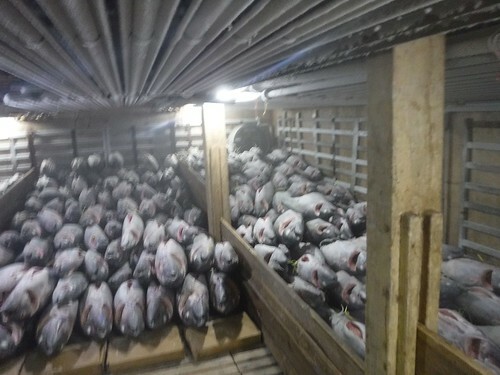 The current budget is able to fill about 30 of the 88 billet gaps for the summer with Summerstock personnel.The Summerstock program is strictly a volunteer program. 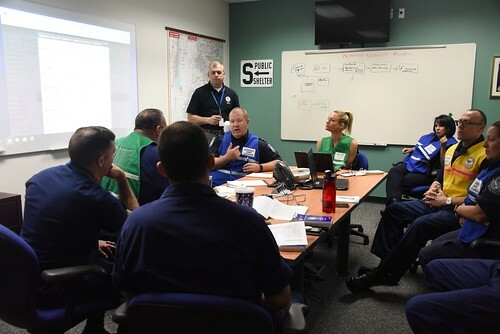 The 9th District conducted an operational risk analysis to identify where additional personnel would be most beneficial by using historical data and field input and ensuring alignment with the Coast Guard’s Great Lakes Maritime Strategy. Billet solicitation normally occurs around the beginning of each new calendar year. The solicitation targets reservists at the rank of petty officer second class and below who live in the Great Lakes Region. For example, although Stefanidis doesn’t technically live in the 9th District, the short four- to five-hour drive from his home in Long Island places him within the region. The short drive saves money for the Coast Guard and gives Stefanidis useful operational experience on the other side of the state in Sackets Harbor. Because some operational needs can’t be filled locally, Summerstock also draws on reservists from outside the region, like Lesberg from San Diego. As a fully qualified coxswain and boarding team member willing to enjoy a summer on the Great Lakes, he still saves the Coast Guard several months of expenses while providing coverage when it is most needed. Petty Officer 1st Class Wesley Koran, a reservist from Station Sheboygan, Wis., and a participant in the 9th Coast Guard District’s Summerstock program, assist a local dive team prepare for a dive off the shore of Sheboygan, during a joint agency exercise on Lake Michigan, Sept. 4, 2012. U.S. Coast Guard photo by Station Sheboygan. “Most reservists have full-time jobs and have a tough time getting away for three months, so we target the lower-ranking individuals because they are usually more available,” said Beck. “Some of them are attending school, so they are on summer break and working for the Coast Guard full-time is a great way to earn money for school while enjoying the summer on the Great Lakes.”Even though Summerstock is a good deal for the Coast Guard and qualified reservists, finding people with the background that the field units need is tough. Not to mention, finding reservists with the flexibility to deploy for three months has been extremely difficult. However, Summerstock reservists are now given more flexibility in their work schedule. In the past, reservists were asked to volunteer all summer or not at all. Now, on a case-by-case basis, reservists can apply for Summerstock and spend the amount of time that their schedules allow. However, the three-month service time is still the preferred route. The Coast Guard re-invigorated Summerstock by dedicating the increased personnel capacity to “venture capital” projects; placing them in new or previously under-served areas to test whether Coast Guard presence could make a difference for the better.“I would absolutely recommend this program to reservists in need of operational experience, because I have 125 hours of underway time that I otherwise would not have been a part of as a normal ‘two-days-a-month’ reservist, “said Randall. For example, Station Duluth, Minn., was augmented this summer with four additional Summerstock reservists. The extra staffing enabled Senior Chief Petty Officer Robert Pump, the officer-in-charge, to have an operationally available crew for the Lake of the Woods, Minn., which does not normally have a routine Coast Guard presence even though it is the sixth largest freshwater lake in the country. The opportunity to put a crew out on the Lake of the Woods in 2012 was a high priority because the remote lake is not routinely watched-over by the Coast Guard due to its remoteness. The Summerstock reservists were the only Coast Guard representation on the remote lake this year. The Summerstock program also supplied five Coast Guard reservists for watchstander positions at the new Operational Integration Center at Selfridge Air National Guard Base, Mich. Summerstock personnel filled a documented staffing gap for the seasonal watch positions and provided full-time Coast Guard representation to work toward a truly integrated operations center. For more information about this program, contact Calvin Ridley at Calvin.A.Ridley@uscg.mil, and for information on how to sign up for Summerstock, look for the solicitation announcement in the Coast Guard Message System in January 2013.